When someone says “I’m British”, what exactly does he or she mean? Specialists in various areas of research will consider possible answers to this question at a conference on Britishness organized by LMU’s Institute for English Philology. On September 14-16, the Institute for English Philology at LMU will host an interdisciplinary conference entitled “Quo vadis, Great Britain? 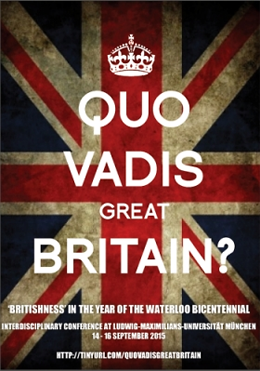 ‘Britishness’ in the Year of the Waterloo Bicentennial.” PD Dr. Felicitas Meifert explains why the Institute has chosen the year 2015 as a suitable occasion for a reappraisal of aspects of Great Britain’s image of itself. “The Battle of Waterloo was a crucial element in the formation of a British identity. The bicentennial of the battle therefore marks an important date in the political and cultural history of Great Britain,” she says. And it presents an ideal opportunity to illuminate the cultural development of British identity since that fateful encounter with Napoleon’s France in 1815, and to assess its present status from a variety of angles. Modern-day Britain is widely viewed as a classical melting pot, as a prime example of a multicultural society that is home to a wide spread of ethnic groups. Among the issues that will be discussed at the conference is the multifaceted impact of this ethnic diversity on the evolution of a national identity. Within this overall context, contributors to the conference will discuss the rise of Scottish nationalism, the role of the monarchy, the foreign policy of the present Conservative government, and analyse perceptions of migrants and their experiences, as well as the concept of Britishness, as reflected in contemporary English literature.